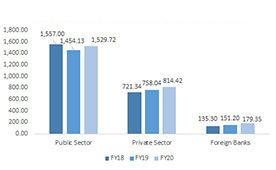 Total credit extended in India reached US$ 1.3 trillion as of Q1 FY19. India and China are potentially large markets, so we want to grow in what we call the sweet spots of the market, such as staffing with added value. As per the Reserve Bank of India (RBI), India’s banking sector is sufficiently capitalised and well- regulated. The financial and economic conditions in the country are far superior to any other country in the world. Credit, market and liquidity risk studies suggest that Indian banks are generally resilient and have withstood the global downturn well. The total value of mergers and acquisition during 2017 in NBFC diversified financial services and banking was US$ 2,564 billion, US$ 103 million and US$ 79 million respectively @ . The biggest merger deal of FY17 was in the microfinance segment of IndusInd Bank Limited and Bharat Financial Inclusion Limited of US$ 2.4 billion @ . As of September 2018, the Government of India has made the Pradhan Mantri Jan Dhan Yojana (PMJDY) scheme an open ended scheme and has also added more incentives. The Government of India is planning to inject Rs 42,000 crore (US$ 5.99 billion) in the public sector banks by March 2019 and will infuse the next tranche of recapitalisation by mid- December 2018. To improve infrastructure in villages, 204,000 Point of Sale (PoS) terminals have been sanctioned from the Financial Inclusion Fund by National Bank for Agriculture & Rural Development (NABARD). Between December 2016 and March 2017, a major drive was undertaken to boost use of debit cards, resulting in an increase in the number of Point of Sale (PoS) terminals by an additional 1.25 million by 2017 end from 1.52 million as on November 30, 2016. The number of total bank accounts opened under Pradhan Mantri Jan Dhan Yojana (PMJDY) reached 333.8 million as on November 28, 2018. Also, the advancements in technology have brought the mobile and internet banking services to the fore. The banking sector is laying greater emphasis on providing improved services to their clients and also upgrading their technology infrastructure, in order to enhance the customer’s overall experience as well as give banks a competitive edge. India’s digital lending stood at US$ 75 billion in FY18 and is estimated to reach US$ 1 trillion by FY2023 driven by the five-fold increase in the digital disbursements. Exchange Rate Used: INR 1 = US$ 0.0139 as on Q3 FY19.